South Carolina Gov. 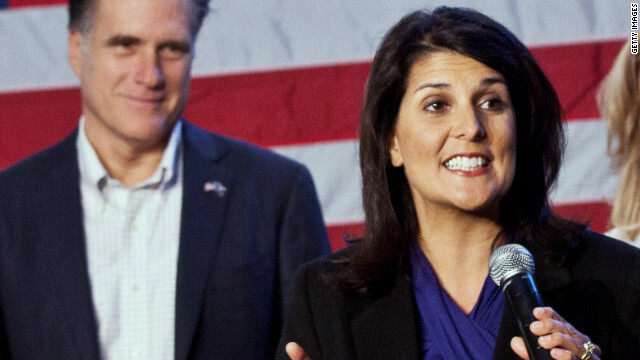 Nikki Haley is among the Republican leaders who will be speaking at the GOP convention. Editor's note: William J. Bennett, a CNN contributor, is the author of "The Book of Man: Readings on the Path to Manhood." He was U.S. secretary of education from 1985 to 1988 and director of the Office of National Drug Control Policy under President George H.W. Bush. (CNN) - When the Republican National Convention kicks off this week in Tampa, Florida, the nation will notice one thing before anything else: This is not your father's or grandfather's Republican Party. Rather, it's a party with leaders as diverse as the country it intends to represent. With the nation's changing demographics, Republicans can no longer rely on the South and Midwest to carry them to victory in 2012. Instead, they must broaden their base into traditionally purple and blue states. It's an uphill battle: President Obama leads by a sizeable margin with women and by wide margins with Latino and black voters. But it's not insurmountable. Romney already leads with men by roughly the same number President Obama leads with women. Nor is it unprecedented. Republicans won a landslide victory in the 2010 fall midterm elections. Now they must devise a strategy to repeat that. Republicans, in short, must repeat what they did in their landslide victory in the 2010 fall midterm elections. Despite what a lot of white conservatives like to say at their dinner parties, most of the vote-capable Hispanics who are in the U.S. today are NOT subhuman welfare bunnies. We work hard to get ours because we KNOW that nobody is going to get it for us, but us (certainly not white conservatives, history points that painfully out). That being said, if they want us to stop whatever we're doing to make a living to give them a vote, they have to tell us, what's in it for US??? Good luck with that. After some of the heated racial vitriol I've heard from the far right, it's hard to win minority votes when the KKK / Neo-Nazi sympathizers (as well as actual members) will be voting for Mitt Romney.